Greetings Everyone-it's Carol here today! 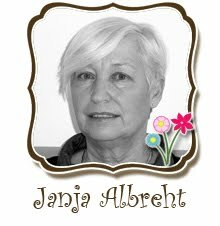 Today I have a CottageCutz card to share. 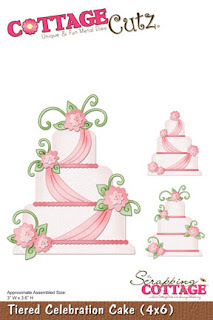 It is make with the Tiered Celebration Cake die. What makes this so versatile is that it could be a Birthday Cake or a Wedding Cake. It was so fun to put together. I just love these dies! 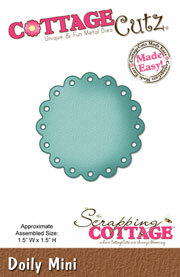 I used the Cuttlebug Swiss Dot embossing folder on the cake to give it some texture. I also colored my cake icing with copic markers. The lace is Martha Stewart punch around the page. There are tiny pearls in the center of the flowers on the cake. This is the beautiful die I used. Isn't it awesome! 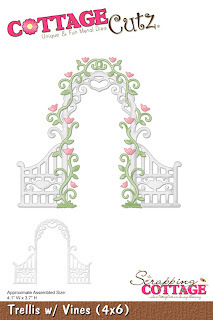 Please be sure to check out the whole line of the Wedding Collection. They are just gorgeous! Thanks for stopping by today. I really appreciate it. See you again soon. 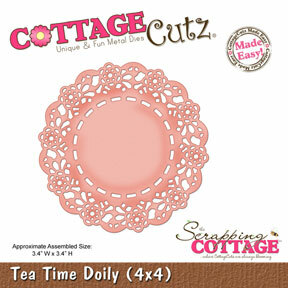 I have a fast post for today, sharing another CottageCutz Calendar for 2013! I love making these darling Calendars and have been having a ton of fun with them. I think they would be perfect gifts for Christmas and you can add photo's to them. I left spots where the photo's will go for each month, and each month is different. 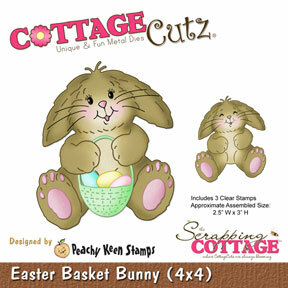 Of course I had to use the DARLING CottageCutz Easter Basket Bunny from The Scrapping Cottage! 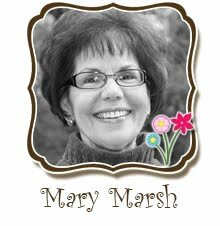 I just love this lil' sweetie and she is perfect for the month of Easter, yep next year Easter falls in March. 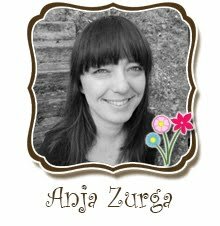 I also decided to use the CottageCutz border picket fence die, love this and I use it a lot on other projects too. The tag is perfect size for this calendar and made a perfect fit! Hi everyone! 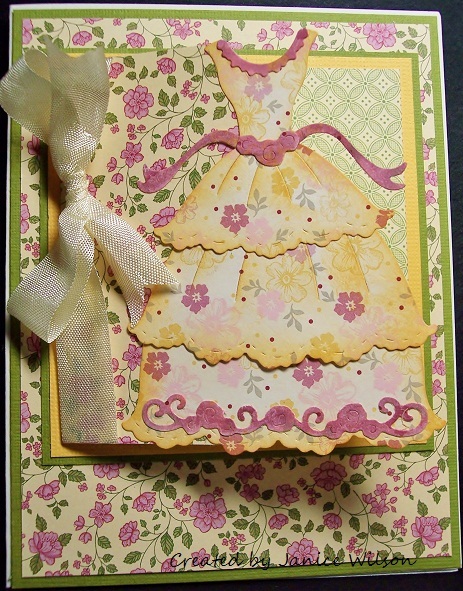 Today's card features the CottageCutz Special Occasion Dress from the Wedding Release. This dress can be made several ways for a variety of occasions. I used patterned paper for the dress and inked the edges with Memento dandelion ink. 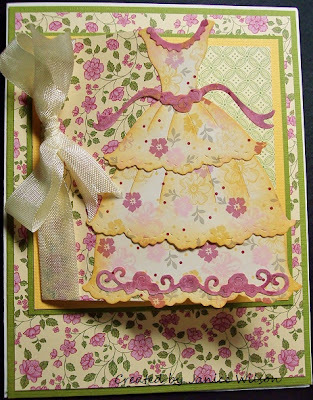 As I was seeing which papers I wanted to use for my card, I thought it would be cute to make a small notecard for the front of the card, using the dress as the opening. Alone, the notecard would make a cute gift enclosure. Added to the front of a standard card gives you a fun fold. This dress could be used for prom layouts, weddings, Sweet 16 birthdays. It happens to be my youngest son's birthday today. He turns 16, but I don't think he would appreciate a Sweet 16 birthday card. lol Enjoy your day! Hello and happy Sunday to you! 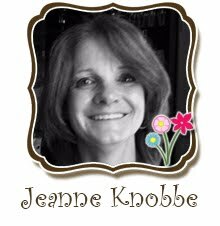 Oh, what a glorious Sunday it is for us, (and it's Lorie here today, BTW), because it's RAINING!! We've seen little more than a drop here and there for almost exactly 4 months! We're DEFINITELY doing the happy dance today!! 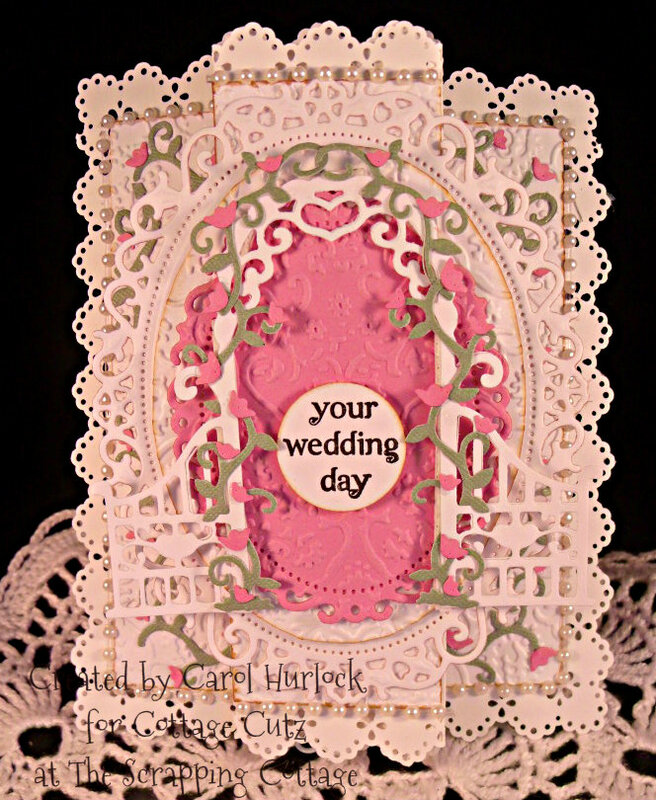 Another reason for happy dances would certainly be weddings, and I have a card to share with you on this rainy day that was made with CottageCutz dies from the Wedding Release at The Scrapping Cottage. Here's the card I created with the dies, which I'll list below. I used a variety of Copic markers shown in the photo below to color the image, which was cut with Express It Blending Card. The VERY best choice for coloring with Copic markers, in my humble opinion. Oops! Looks like I've got BOTH of my N4 markers in there! LOL!! Here's a closer look at the entire card. And again, here is the finished card. 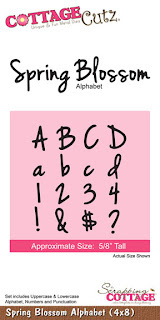 The sentiment comes from Stampin' Up!, as does that beautiful ribbon. I added a few rhinestones to the cans, for yet a little more bling. Gotta LOVE that bling!! 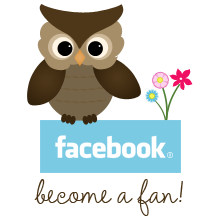 Thanks so very much for visiting The Scrapping Cottage Blog today! We always love to have you stop by! I hope you have a blessed and beautiful day, and that you're finding reasons to be doing the happy dance, too! Happy crafting!! Hi everyone Cindy here with a SWEET CottageCutz Design. I have made a baby card using some CUTE dies from the CottageCutz store. Hello everyone and Happy Wednesday to all!!! 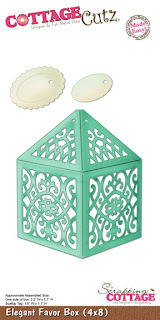 Today I'm sharing the Beautiful CottageCutz Elegant Favor Box decorated up with the CottageCutz Trellis and Vine Die, both are from the Wedding Release found HERE! I love putting these beautiful CottageCutz Favor boxes together, and they are perfect for Birthdays, Holidays, Just because, Goodies, Cookies, and giftcards. I think these will be perfect for Christmas time too, for goodies and giftcards as well. 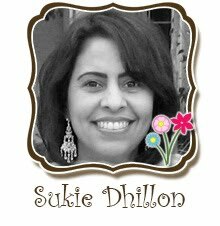 Today it's Carol here and I have something to share with you using CottageCutz Trellis and Vines Die. Isn't this amazing! I can just imagine the look on the Bride and Grooms face when they open this beautiful handmade card to celebrate their special day! To be quite frank with you I have no idea what the name of this style card is. I have seen it done different ways but I am not sure if I ever read what the name of it was. For all intentional purposes I will give you measurements on how I created this. It is so easy and it looks so impressive. You are going to use a piece of card stock that measure 6" x 12". You are going to score this piece at 3-3/8", 5-1/8", 6-7/8", and 8-5/8". This is to show you what it will look like once you use your bone folder to crease the scores. This card will stand on it's own beautiful and folds up nicely. As you can see in the picture below. 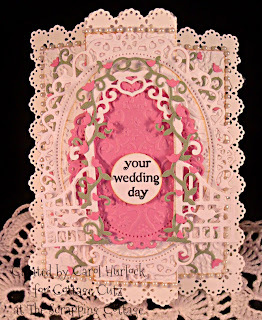 The Martha Stewart Decorative Doily punch around the page was use to decorate the outside of this card. I punched it continually. There is a little bit of "fudging" on the 6" side but the 12" worked out perfectly. 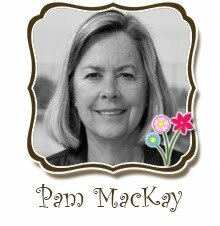 Use a cuttlebug embossing folder of your choice to create the embossed pieces on this card. The measurements are 2 pieces for the ends at 2-7/8"x5" and 3 pieces for the center at 1-5/8"x5". After embossing run Rangers Brushed Corduroy Distress Ink ever so lightly on the edges. The center piece is the Spellbinders Fleur De Lis Oval. Cut one large oval in white and one the next size down in pink. Emboss the pink piece with the same cuttlebug embossing folder and layer with foam dimensional pads. 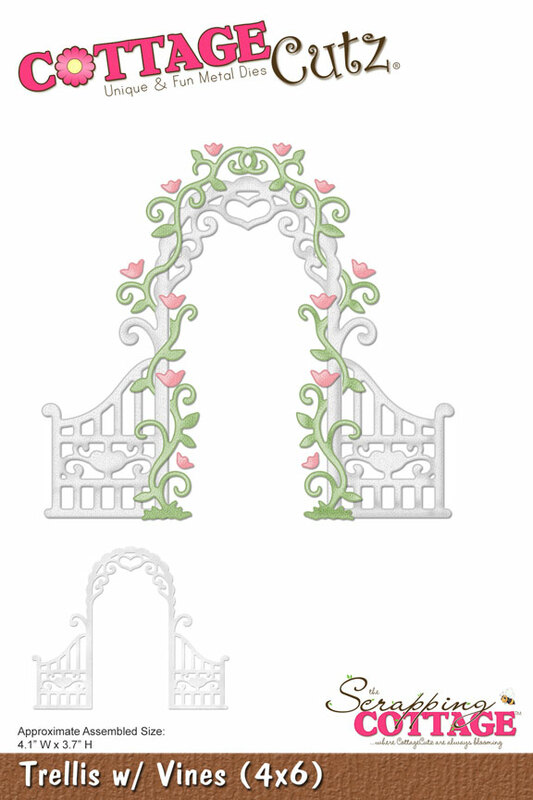 Use the Vines and Flowers from the Trellis to decorate the outside edges of the card. Doesn't it finish it off perfectly! You will need 6 of the long vines and 2 of the small vines to completely decorate the edge as seen here. The last finishing touch if desired are some pearl lines. Thanks so much for viewing this project. If you have any questions, please just leave a comment and I will answer to the best of my ability. This was a bunch of fun to make and I would love to see yours! Have a great day! You will be seeing a ton of Calendar Months to come :) I'm trying to finish up a Full 2013 Calendar using the DCWV Calendar Kit! My Calendar was designed for The Scrapping Cottage using some of the DARLING CottageCutz Dies :) LOVE THESE! 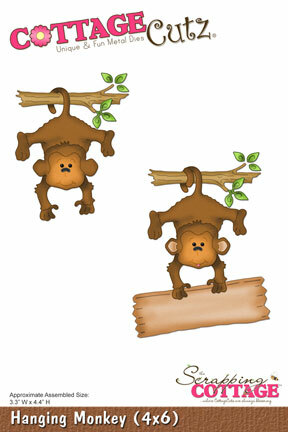 and this Lil' Hanging Monkey is too CUTE !! He is from the Baby Release. 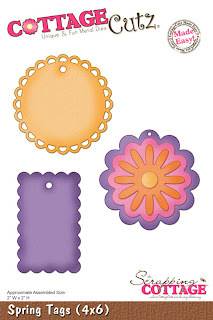 I also used the Tea Time Doily,Spring Tags,Spring Blossom Alphabet, and the Darling lil' Hanging Monkey all areCottageCutz Dies!! The Calendar kit comes with the stickers for the dates, and some other fun stickers too! The Design Paper is also from the kit! Love this as it makes designing easy! I will most likely be using some other design papers too throughout the months, so you aren't just limited to using the dp's that come in this kit.